Mozilla launched the Test Pilot experiments Color and Side View yesterday officially; I reviewed Side View, an extension to display any link or open tab in the Firefox sidebar, yesterday already. Today, I'm going to take a look at the second Test Pilot experiment Color. Color is an interesting experiment as it adds custom theme creation options to Firefox. Anyone can create a new Firefox theme with Firefox Color and distribute it by using built-in share functionality. Note: Test Pilot experiments come and go. There is no guarantee that Color will be integrated natively in the Firefox browser. Mozilla collects usage data when users install Color in Firefox and uses the data and user feedback to determine whether an experiment will be integrated natively in the browser or published as a standalone add-on instead. You need to install the Test Pilot extension and the Firefox Color experiment to get started. You may do so in Firefox Stable or any other version of the browser that is supported by Mozilla. Color opens a special interface after installation which you interact with to create the theme and save or share it. The Firefox Color website displays several interactive elements on the page that depict browser UI elements. You may change any color of listed user interface elements by clicking on the element. Doing so opens a color picker that supports entering HEX or RGB values manually, selecting a preset color, or selecting a color using the color picker. What is great about Firefox Color is that you see the change immediately in the "real" Firefox interface. Any color or texture change you make is reflected immediately in the interface so that you know how it looks like right away. It is easy enough to correct color issues, e.g. when the background color and text color are too similar so that you can't read the text anymore. Any theme you create can be shared or saved for later use. The theme modifications are preserved across sessions. Firefox Colors comes without reset button; the only way that I found to restore the default theme is to uninstall the add-on. While you can create custom themes using Firefox Color, you may also select one of the preset themes instead. Just scroll down on the page to apply a preset theme immediately. Firefox Colors unlocks some color-based interface modifications in Firefox. Users may use it to change the color of most header interface elements in the Firefox browser. I'd like to see additional UI elements such as scrollbars or the context menu unlocked for color changes and maybe even appearance changes in future updates as this would probably be appreciated as well by other users. Now You: What's your take on Firefox Color? 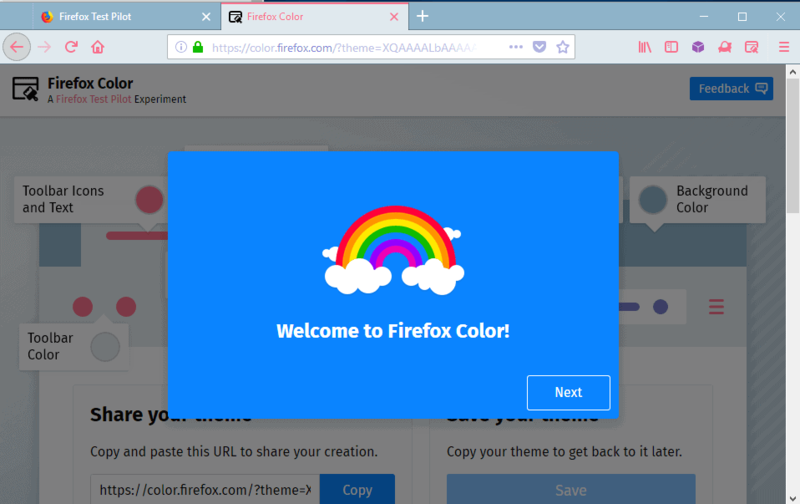 Firefox Color is a new Test Pilot experiment by Mozilla, makers of Firefox, that gives users of the browser options to customize the colors of the Firefox user interface. No words for this experiment, I’m using a lot! I am loving it, Firefox is very good, I was afraid of Firefox Quantum, today I already shut my mouth! The browser with each version gets better! I’m trying it and I like it a lot, it works really well !!! Nice. I hope it gets developed further and makes it into the stable release. I haven’t tried it but I would like to see it be able to also work on all of the menu popups; context menu, overflow menu, bookmark popup and auto complete popups. I think the added resource use would be worth the ability to easily change those items. JMO. The scrollbar in FF based browsers has always been way too large in my opinion so I make it smaller. Control Panel/Personalization/Window Color/ click ‘advanced appearance settings’, set Item drop box to “Scrollbars” , set Size control to 12? Default is 15, I think. Please be serious, compared to full theme we lost, stop calling toy for kids theme. It’s called Firefox Color, not Firefox Theme or Firefox Shape. I know you won’t be able to read but you ‘can’ customize the scrollbar and it looks awesome. Baubles. What’s next ? Something seismic like hexagon buttons with rabbit ears in country colors ? Right, sure, I’ll let Test Pilot snoop on me while trying a half assed skinning Extension which is a lame copy of what Vivaldi have had for ages. Obviously the Firefox devs are too dumb or stubborn to allow FULL THEMES for Quantum, which yes, ARE possible and it’s been proved. Since when has Vivaldi been able to modify ALL of the UI elements that can be changed with the “Color” experiment? I’m not seeing it in my Vivaldi install. Toolbar icons? Theme texture? How do I change those? As far as “Full Themes” go I’ve never had any desire to use one in the 10 years that I’ve been using Firefox. Sorry, I’ve just never been interested in using what appears to me to mostly just be junior high school-ish themes with groovy flowery stars and so forth. The Horror! Besides, from the numbers I see on AMO I doubt even a tenth of 1% of FF users even used a full theme, and the performance, security and privacy improvements that have been made since v57 was released more than makes up for the loss of a feature that 3 people used. LoL. Just saying. Are you seriously comparing Vivaldi with Firefox ? The sheer size of the Firefox plugin community dwarfs anything Vivaldi can offer. A fully functioning color manager is only an update or two away, nothing World ending there. A dark theme with a blinding white search bar does not look good. None of the custom themes can darken the search / url bar. Mozilla needs add more elements or give access to developers. It’s stupid when the default dark theme by Mozilla is the only dark theme that doesn’t look stupid.